Perhaps the strangest looking of all the echinoderms are the homalozoans. Unlike most echinoderms, which are radially symmetrical with five similar sections (as in sea-stars), the homalozoa were secondarily bilateral (as in sand dollars), or even asymmetical. Their body was flattened, with an arm-like aulacophore at one end. The aulacophore was covered in plates, jointed, and had three distinct regions with a central groove in the outer two portions. You can see the aulacophore in the fossil at right. Exactly what the aulacophore was used for is not known. Some speculate that it was an arm used for feeding; others think it was a stalk or foot on which the animal stood (much like the stalk of crinoids); and some have suggested that it was a tail used for swimming (much like primitive chordates). The Homalozoa has only recently been thoroughly studied and examined. The current classification system recognizes two orders: Cornuta and Ankyroida (formerly known as the Mitrata or Stylophora). The Cornuta are asymmetrical and shaped like a boot; the Ankryoida were bilaterally symmetrical (had a left and right side). Altogether there are 12 families and 60 genera known. 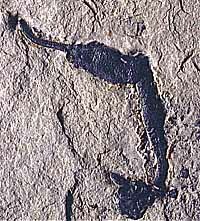 Fossils of Cornuta are known from the Middle Cambrian to the Late Ordovician; the Ankyroida are known from the Early Ordovician through the Late Carboniferous. Pictured at left is Castericystis, a cornute homalozoan from the Middle Cambrian Marjum Formation of Utah. This fossil is found alongside the trilobite Elrathia, and other marine fossils. Image of Castericystis taken by B. M. Waggoner. B. Lefebvre, P. Racheboeuf, & B. David, 1998. "Homologies in stylophoran echinoderms". Pp. 103-109 in Echinoderms: San Francisco (Proceedings). R. L. Parsley, 1998. "Taxonomic revision of the Stylophora". Pp. 111-117 in Echinoderms: San Francisco (Proceedings).